PC makers are starting to take more interesting design risks. The gaming laptop renaissance is upon us. For the past few years, they've been getting thinner, lighter and more powerful, thanks to NVIDIA's 10-series Max-Q graphics cards. But this year at CES, they got truly weird and wild. Alienware's Area 51m lets you swap out its CPU and GPU, like a proper desktop! 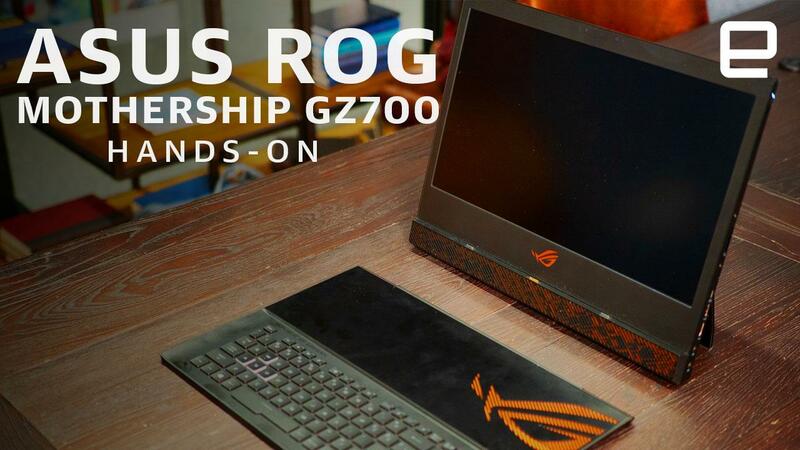 ASUS's ROG Mothership is basically an all-in-one PC masquerading as a notebook. And Acer's Predator Triton 900 has one of the craziest hinges we've ever seen. The big takeaway? PC makers are experimenting more with gaming laptop designs than ever before. That's a good thing for consumers, since it's leading to potentially useful new form factors. And it's even better for the PC industry, since all of that competition will hopefully spur every company to be a bit more innovative. Not everyone will need these machines, but the lessons PC companies learn from them could eventually trickle down to all of their computers. 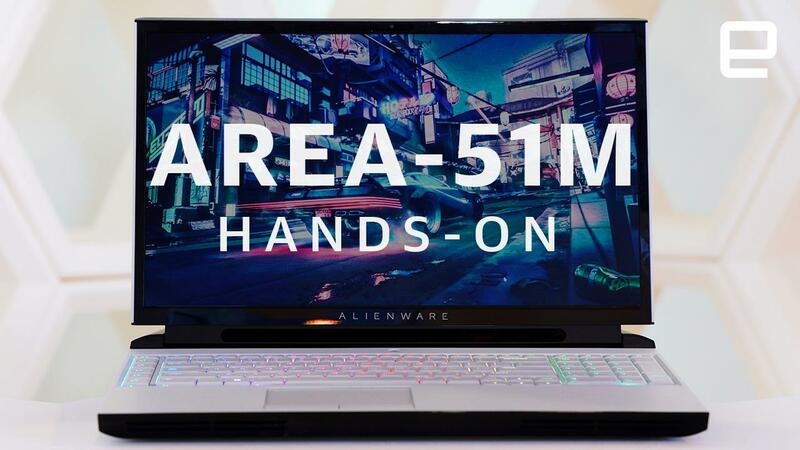 Take the Alienware Area 51m. It seems like an almost impossible creation -- it's a 17-inch notebook powered by Intel's latest desktop CPUs and chipset, as well as NVIDIA's RTX 20-series GPUs, all in an 8.5-pound package. Once you open it up, you can swap out the CPU, GPU (via Dell's Graphics Form Factor card), storage and RAM. It basically gives you most of the customizability of a gaming desktop in a sleek laptop. Sure, it's heavier than the sub-five pound gaming notebooks we're seeing these days, but plenty of players still opt for heavier machines if they're tinkering-friendly. The Area 51m could be just what a PC gaming addict needs. What's most intriguing, though, is how much the Area 51m goes against the grain of the entire PC industry. Ever since the debut of the MacBook Air, everyone has been rushing to deliver sealed unibody designs that look great, but are typically hard to disassemble and upgrade. Alienware is hearkening back to one of the core aspects of PC gaming: the ability to customize and upgrade to your heart's content. Admittedly, some gaming laptops today still let you upgrade their RAM and storage, but Alienware is taking things further than anyone else. The ROG Mothership looks less refined than the Area 51m, but it's a beautiful beast. When it's closed, it looks like a typical ASUS gaming machine. But upon opening it, a kickstand pops out from behind the massive display to hold up its weight. And when you lower the keyboard, you can pull it away to use wirelessly. All of the hardware is behind the display, just as it would be on an all in one PC. It's a machine made for gamers who want to put a little distance between their screens and input devices, or those who want to be able to swap out their keyboard for a mechanical model on a whim. I'll admit, the ROG Mothership looks and feels imposing. It weighs over 10 pounds and feels like a tank in your hands. But its flexibility could be appealing to gamers who want less of a laptop-like experience at LAN parties and esports events. And much like Microsoft's Surface machines, it's a unique spin on a pre-existing PC concept. 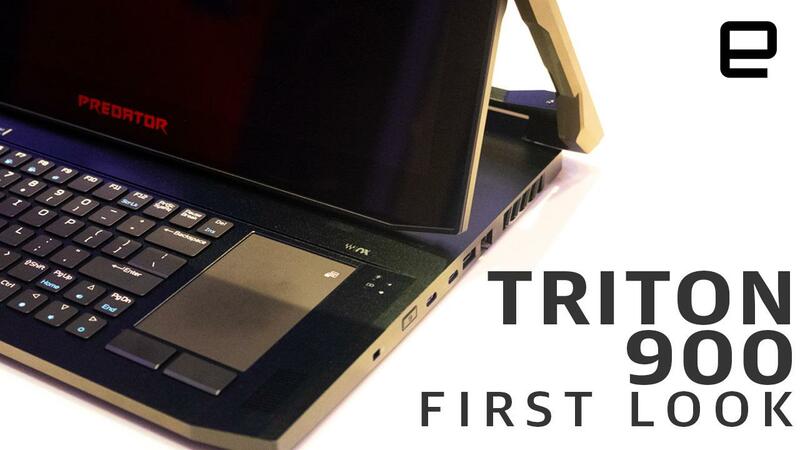 I didn't get to spend much time with the Acer Predator Triton 900, but its hinge is certainly attention grabbing. It lets you rotate the screen in four different orientations, similar to what you'd expect from a convertible PC, except on a gaming machine. At $4,000, the Triton 900 is clearly a tough sell -- and I can't imagine how many gamers actually want rotating screens. But it's intriguing, nevertheless. Powering all of these machines is NVIDIA's RTX 20-series graphics, which also enable entirely new features like real-time ray tracing. Like the previous generation, there are "Max-Q" designs to help these GPUs fit into thinner notebooks. But what's really interesting this year is that all of these unique machines aren't relying on Max-Q chips at all, so you can expect faster speeds than thin gaming laptops. NVIDIA deserves plenty of credit for helping notebooks to slim down while offering decent gaming performance, but it's nice to see that's not all PC makers are using them for. Even casual gamers might have some intriguing new options this year. AMD just announced its next generation Ryzen mobile CPUs, which include Vega GPUs, and Intel claims its upcoming 10nm chips will feature integrated graphics with over a teraflop worth of performance. We don't know how well Intel's new tech will work out, but we did briefly see it running Tekken 7 on a very thin PC. Basically, there's a good chance you'll actually be able to handle some basic gaming on your next ultraportable. So where do we go from here? I wouldn't be surprised if more PC makers tried to tap into the potential of laptop gaming. With NVIDIA's GPUs, they're all more powerful than the PlayStation 4 Pro and Xbox One X. Perhaps we'll see a resurgence of docks that let you easily plug in laptops to TVs (and hopefully they'll be sleeker than MSI's GPU-powered dock from 2014). Something similar to HP's Compact Desktop dock might work, especially if it lets you slide in a laptop as easily as a Nintendo Switch.